Drinks, jewels, clothes, art—The Way of the World is awash in the finer things in life. 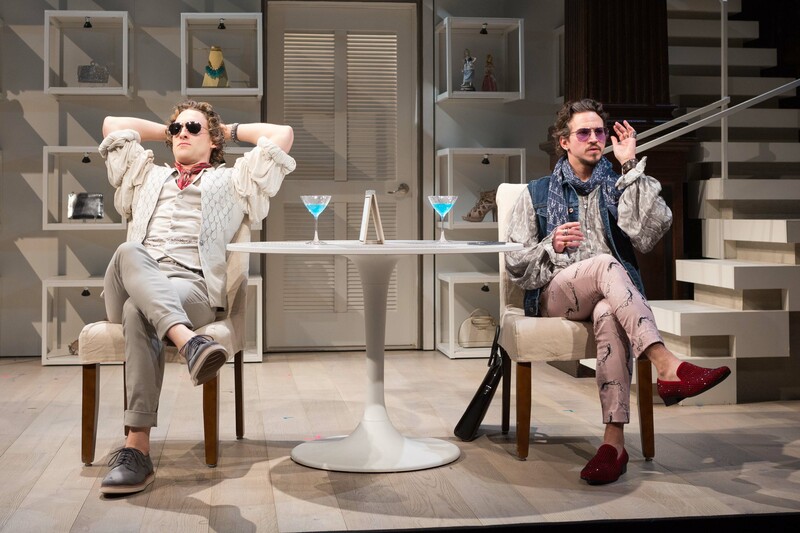 Props designer Tony Koehler recently spoke with The Folger Spotlight about the secrets behind the glitz and glamour of Theresa Rebeck’s smart satire. Henry (Luigi Sottile) and Charles (Brandon Espinoza) enjoy cocktails in the opening scene of The Way of the World. 2018. Photo: Teresa Wood. Scene 1. An outdoor table at a swank restaurant. A glorious sky. HENRY and CHARLES are having martinis. These are the first words in Theresa Rebeck’s The Way of the World, but certainly not the last mention of cocktails—which provides a huge task for props designer Tony Koehler. “There is a cocktail in almost every single scene,” he explains backstage at Folger Theatre. 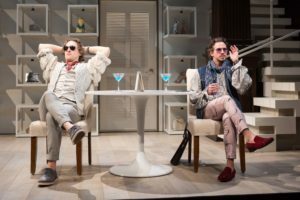 “I think that 47 was the last count.” To make matters more complicated, characters drink multiple types of drinks, requiring Koehler to find the right look for each beverage sipped (or slammed) in this fictional version of a swank life in the Hamptons. Moreover, each cocktail has to be easily prepared—no time for complicated mixing and measuring backstage. 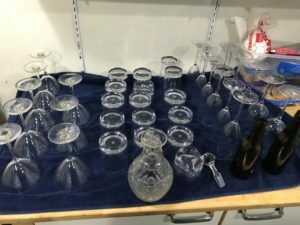 Glassware drying backstage after a performance of The Way of the World. The scenes don’t always allow the actors to finish these mocktails, so “whatever doesn’t get consumed is poured out in backstage buckets—it’s like a wine tasting with a lot of colored cocktails.” Another difference from actual alcohol? “There are lots of monologues in this show and it’s really fast, so it’s actually good for them to have access to liquids onstage.” To prevent drinks from spilling, Koehler attached a metal sheet to a black restaurant tray using black gaffe tape (“my favorite supply”), which magnetically attracts the metal washers attached to the bottom of the stemware to keep them from tipping. In addition to what goes in the glasses, there’s also the logistical puzzle of making sure each character is served the right drink at the right time. Luckily, Koehler had help from Jessica Short, Assistant Stage Manager, who tracked the tracked the growing number of cocktails during the rehearsal process, and Christina Miller, Production Assistant, who is responsible for washing the glassware each night. “It’s like a party every night. There are multiple types of each kind of glassware,” Koehler says. Henry (Luigi Sottile) and Waitress (Ashley Austin Morris) with the spider brooch. The Way of the World, 2018. Photo: Teresa Wood. Another key prop is Rene’s ornate spider brooch, which may or not be Faberge (but is definitely worth a lot of money). To find the perfect accessory, Koehler began with clues describing the brooch in the script (“I did want to show him that silly little spider brooch. It might be Faberge. If it isn’t it’s still nineteenth century, and it’s a gorgeous piece.” “This thing is real! Gold, and diamonds and rubies.”) and did some searching. In the end, two versions of the chosen brooch were purchased so that they could be both costume and props, with a little paint added to turn fake-diamonds into fake-rubies. Koehler, creating the paintings for the art gallery. And the beautiful items that decorate the set? That’s where the merchandiser’s eye came in. The Waitress (Ashley Austin Morris) in The Way of the World, with the display cases in the background. The Way of the World, 2018. Photo: Teresa Wood. In the play, the character of the Waitress makes the point that people in the Hamptons have a great eye for fashion and design, and know the value of everything. We bet if they saw Koehler’s props on the Folger stage, they’d say it looked like a million bucks—or maybe even $600 million. Thanks to Tony for speaking with us! 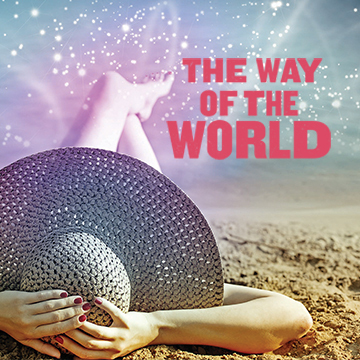 This weekend is your last chance to see Folger Theatre’s The Way of the World, which closes Sunday, February 11. For tickets and more information, visit us online or call the Folger Box Office at 202.544.7077.